Palmieri stands on 500 years old tradition of production finest virgin olive oil. Collaborating with experts and renowned chefs, unique flavors were blended together to create a sensory experience. 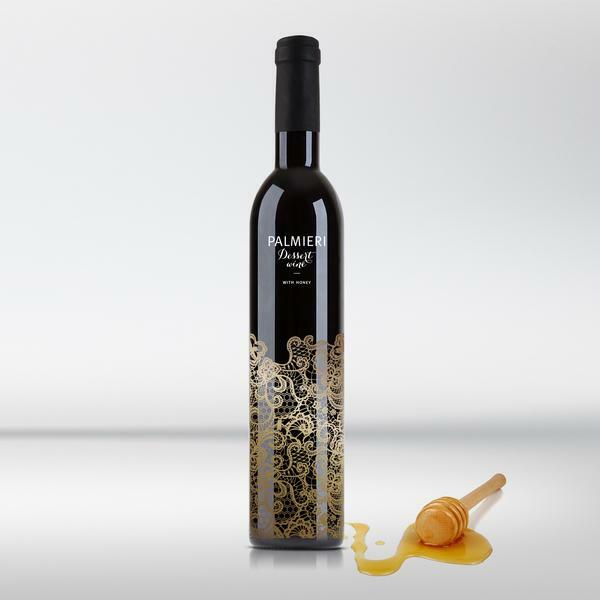 Palmieri desserts were born from synergy of bringing together the right ingredients to make Dessert wine with honey, Dessert wine with vanilla and most famous Dessert wine with white truffle. Dessert wine are entirely natural and almost entirely locally sourced. Aged and created in the greater Ljubljana region, the bottles are prepared for immediate consumption. Palmieri olive oil stands on 500-years long family, named Palmieri, tradition of producing the best virgin olive oil. The quality of Palmieri virgin olive oil is the result of people working hard and with passion and striving for maintaning the level of production the best virgin olive oil. Forged with only premium vanilla, this blend of flavours brings out a playfully fruity sensations to the pallet. With a softer bouquet, the delicate nature of the vanilla lends its nature to enhance the original sweetness of the Refosco taste. The Dessert wine with Vanilla contains absolutely no artificial colours or flavours. The ingredients are entirely natural and almost entirely locally sourced – with the exception of the quality vanilla stands, which is imported. Selected from only the best in the long-standing traditions of honey production within Slovenia, quality honey is more than ensured. The smooth, syrupy taste lends itself to infuse the pallete with both a soft, and intoxicating flavor. Stemming from the rich tastes, a hint of rum is added to each batch to extentuate the aftertaste of the wine Refosco. Curated in tandem with it’s wholly natural and locally sourced ingredients, the dessert wine is best shared. Selected and imported from the finest areas of Italy, the white truffle blend infuses the Refosco dessert wine with a powerful aromatic flavor. Upon first combining the flavors, little to none of the potency of the delicate truffles were lost in the mix. In fact, the sensational bouquet rises from the glass as it’s poured, setting the scent before enjoying the rich, sweet taste. Created with grapes harvested in the Koper region of Slovenia, comprised of only the finest, natural ingredients. Golden flakes in extra virgin olive oil will add a special touch and premium value to your dishes. It looks divine drizzled over grilled fish, pieces of cheese or simply used as a dip with bread. For those who believe in the wonders of the shining gold. Our virgin olive oil is with intense fruity aroma and mild flavor. Virgin Olive Oil with Gold & White Truffle is for those who search not only an unique and sophisticated taste but also an aesthetic pleasure within their food. 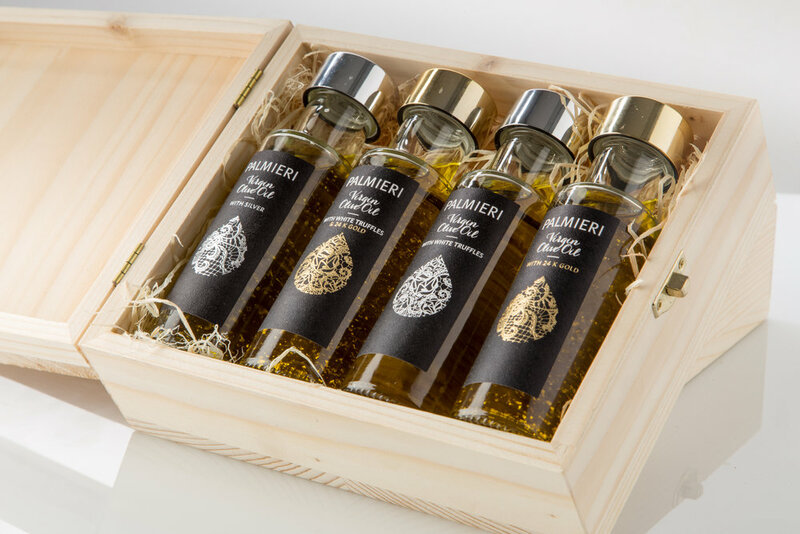 Palmieri olive oil with gold and white truffle provides you with truffles of superior taste and natural aroma. We remain connected to natural ingredients and tradition. Designed for use in professional kitchens - use sparingly! Silver flakes in Palmieri extra virgin olive oil will add an unique calming visual effect to your favorite meal. Reserved for those, who indulge in the cooling and calming effect of the precious silver color. Palmieri olive oil provides a pleasing feel in the mouth, and satisfies the appetite. Futher on the silver flakes in oil on a dish boost an appetite in every gourmet. 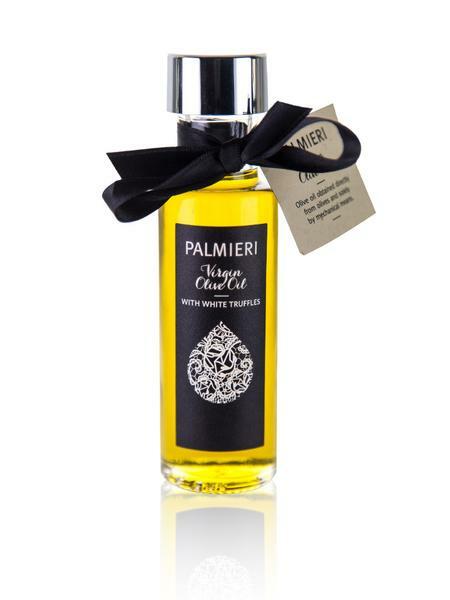 Palmieri Virgin olive oil with dried white truffle is perfect for enhancing salads, carpaccios, fillet steak and other dishes. It will add depth and an excellent taste experience. The exquisite enhancement of the smell and taste is reserved for the greatest of gourmands.